I love having the date on brand new posts. It boosts engagement and click-through. But once a post is weeks or months old, that same date stamp is a hindrance for engagement and conversion. 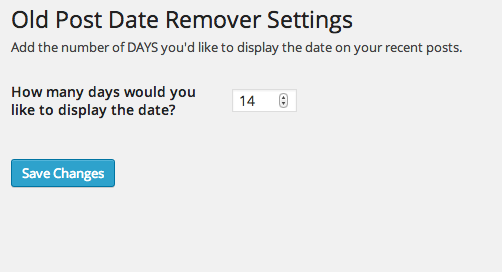 This plugin dynamically removes the dates from posts once they reach a certain age. As of version 2.0 it is now user-customizable! Pick how many days you want the date to be visible on your single posts, and you are all set! This plugin removes the date stamp using CSS and the wp_enqueue() function. This means that any CSS you’d like to apply only to older posts is a go. Add your custom CSS to the included CSS file, but be aware that updates to the plugin will overwrite your changes! Note the really old date just glaring at you under the title. Ahh, this post feels brand new again to your reader! Pretty darn self-explanatory, if I do say so myself. It’s the nature of WordPress (open source, humongous user base, etc) that plugins won’t work for everyone. If you install the plugin and it isn’t working, it’s likely a simple matter of how your specific theme calls for the date stamp. I put together this tutorial video to show one way to help me help you. As always, direct any questions to the support forum for the plugin, where I will actively answer.